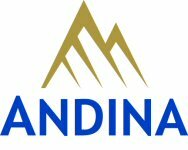 ANDINA Minerals Inc. (TSX VENTURE:ADM) ("Andina" or "the Company") is please to announce that it has commenced an aggressive CDN$2.3 million Phase II exploration program on its Volcan Gold Project, strategically located within the Maricunga Gold Belt, 170 kilometres east of Copiapo, Chile. A diamond drill rig and a reverse circulation ("RC") drill rig have been mobilized to the property and drilling activities are planned to start on October 15th. In addition, an inferred resource estimate for the East Zone is in the process of being finalized and will be released prior to the end of October, 2005. The Phase II exploration program will consist of approximately 5,600 metres of reverse circulation drilling and 2,000 metres of diamond drilling along with approximately 7,000 metres of surface trenching, associated channel sampling, geological mapping and prospecting. "We are excited to again be drilling at Volcan now that the winter has ended." said Carl Hansen, President and CEO of Andina. "Volcan is our key project and this upcoming exploration campaign combined with the pending East Zone resource estimate marks our first major step in establishing the economic significance of this 5,000 hectare property." Andina's main focus during this exploration campaign will be directed towards infill drilling and expanding the limits of the East Zone gold mineralization and establishing the continuity of the Central Zone gold mineralization to depth. The goal of the program is to outline an economically significant gold resource by the first quarter of 2006 while defining targets for the next exploration campaign. Maps of the Volcan property and of the East and Central Zones can be found on the Company's website at www.andinaminerals.com. The primary focus of the drilling program will be the East Zone where gold mineralization has been identified by surface trenching and drilling over a strike length of 400 metres, true widths of up to 100 metres, and an average vertical depth of approximately 125 metres. In May 2005, Andina drilled a single diamond drill hole into the East Zone which returned 146 metres grading 1.27 grams per tonne gold starting from surface confirming the significant potential of the East Zone (see June 29, 2005 Company press release for further details). Approximately 3,500 metres of RC drilling (11 holes) and 600 metres of diamond drilling (2 holes) are planned for the East Zone drilling campaign. This drilling, combined with the 15 holes drilled during the 1990's by previous exploration companies, should provide sufficient information to establish a resource estimate to a depth of approximately 250 metres. The structurally controlled mineralization is hosted within two parallel, sub vertical hydrothermal breccias, the North and South Breccias, developed within a dacitic porphyry and is associated with abundant sheeted dark grey quartz veinlets with minor disseminated pyrite. The gold mineralization remains open to depth and along strike although the strike extent is suspected to be limited. Andina discovered the Central Zone in early 2005 while trenching an area of strong alteration. The trenching program partially exposed a broad zone of silicification and multi-stage quartz veining with associated gold mineralization over a strike length of 500 metres. Three trenches cut approximately perpendicular to the mineralized zone returned the following results: 2.023 grams per tonne gold over 50 metres, 1.037 grams per tonne gold over 100 metres, and 1.078 grams per tonne gold over 25 metres. The mineralization remains open along strike and to depth. The current exploration program entails 2,750 metres of drilling, comprising 650 metres of diamond drilling (2 holes) and 2,100 metres of RC drilling (8 holes), targeting the Central Zone. Two cross cutting drill holes (one drilled north and one south) will be drilled on five north-south oriented sections spaced 100 metres apart. The goal of the drill program is to determine the potential of the Central Zone to host economically significant gold mineralization and to establish a preliminary resource estimate. However, if results warrant, an aggressive infill and step out drilling program will commence immediately in order to finalize a resource estimate for early 2006. (+ 200 ppb gold) identified by previous operators. collected by Andina during early 2005. Andina is an Americas focused exploration company, with a portfolio of precious metals exploration projects in Chile and Mexico, dedicated to maximizing the value of its exploration assets through a commitment to fiscally responsible exploration. The Company is earning a 100% interest in the Volcan project by undertaking certain work commitments and making a series of escalating payments ending in 2008. Under the guidelines of National Instrument 43-101, the qualified person for the Volcan exploration project is Eduardo Margi, Ph.D. in mining engineering (Witwatersrand) and a Fellow of the SAIMM with over 30 years experience. Dr. Margi has reviewed and approved the exploration program as describe here-in. A summary of the work performed by the previous operators exploring the Volcan property is reported within the Company's Technical Report titled "Review of Gold and Copper Exploration Potential of Mineral Properties in Chile" dated November 12, 2004 which was filed at www.sedar.com on November 24, 2004.